If you carefully observe any bar chart, you can see that even when the stock price is trending upwards or downwards, the price is actually ranging. The only difference between trending and ranging markets is the direction of the range. Once you draw an equidistant channel on any price chart, the ranging nature of price becomes more evident. When Donald Dorsey developed the Mass Index indicator, his rationale was that if the prevailing trend were going to change, the price range would have to widen. If you are having difficulty imagining the situation, look at figure 1, do you see what we mean? Although the Mass Index is great at signaling a potential change in the trend, it will not tell you which direction the trend is changing. After all, an uptrend can gain additional bullish momentum and that will also help make the range much wider. You have to remember that when the Mass Index technical indicator line is going up, the climbing line is only signaling that the volatility of the stock is going up. However, the Mass Index indicator line does not signify any directional bias of the stock. That’s why you need to incorporate other technical analysis tools into your mass index trading strategies in order to identify the change of direction of the prevailing trend. Consider an analogy for a moment, you are driving a car and the mass index calculator, which shows volatility of the stock, is your speedometer. The speedometer of the car will only show how fast or how slow you are going, but you will probably need to use a compass to figure out if you are driving towards the north or the south. Do you think the analogy about comparing trading with Mass Index and driving cars with a speedometer make any sense? In a way, it actually does! Donald Dorsey found that when the Mass Index indicator value goes above 27, the likelihood of the trend to reverse increases. He then developed some mass index trading strategies based on this hypothesis. One of the best known Mass Index strategies is to wait for the index value to go above 27, and then, wait for the reading to drop below the 26.5 level to form a reversal bulge. Once the reversal bulge formation is completed around the 27 level, you can consider that the prevailing trend is going to change very soon. 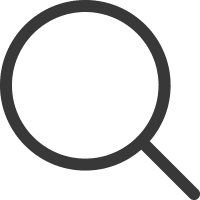 If you are a conservative trader, you should wait for the Mass Index indicator reading to fall below 26.5 before considering any position in the market. 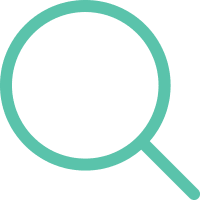 However, as the Mass Index reading over 27 already indicates that the trend is likely to change, you can apply other technical analysis tools to generate an entry signal. If you get an early signal, you can enter the trade much earlier in order to capture the bulk of the reversal move, which would effectively help you increase the risk to reward ratio of your trade as well. The original Mass Index formula uses 25 periods as the default parameter, but you can change this setting in your charting software to match the overall volatility levels of a particular stock. If you decrease the period settings for low volatility stocks, it would help you generate more signals. Nonetheless, remember that if you reduce the Mass Index calculation periods on a highly volatile stock, you will receive a lot of false signals that can seriously increase the chances of turning into losses. If you combine basic technical analysis tools like trend lines with your mass index trading strategies, the result can be fascinating. The price must make higher highs to form a trend line, right? Furthermore, we know that all trends will have reversals at some point. Based on these two obvious facts, you can actually trade the market with the Mass Index! Regardless, one of the major problems with using trend lines is that you never know if the reversal would be strong enough and yield some sizable profit. If the reversal turns into a small retracement and the prevailing trend resumes shortly after you place the trade, you are definitely going to take a loss on that trade, right? If you want to solve such a dilemma, as a volatility indicator, the Mass Index indicator can come handy to cherry pick the best of the best trend line breakouts! 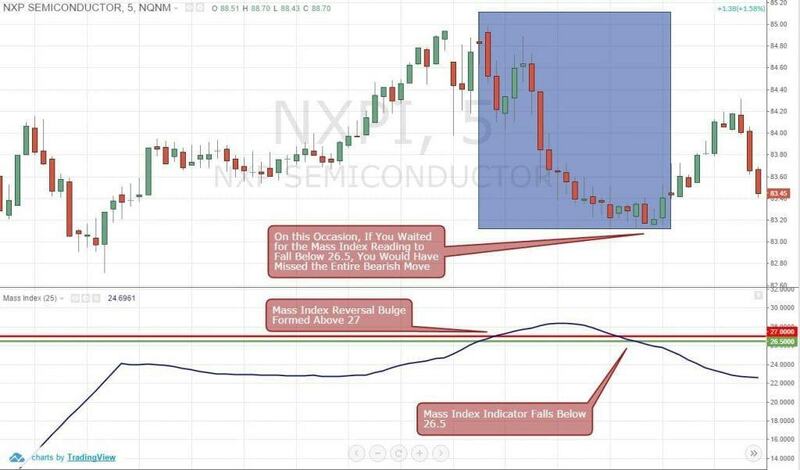 In Figure 3, you can see the NXPI price has formed a nice uptrend line. Once you see the Mass Index indicator line crossing above 27, you can already anticipate a potential change in the uptrend. 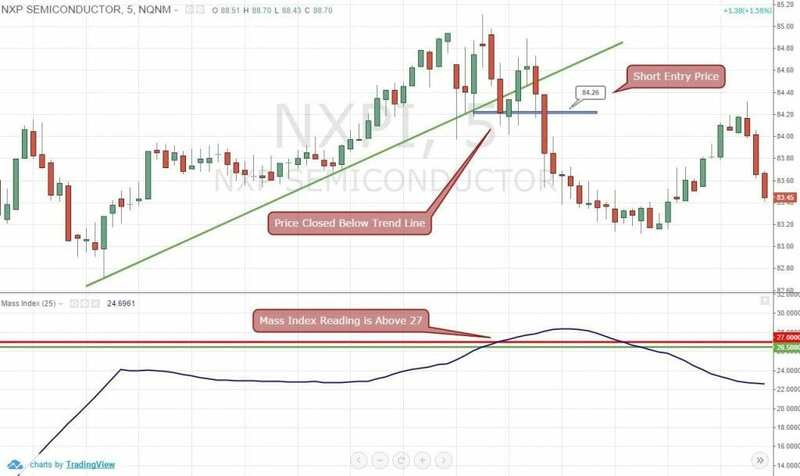 Now, all you have to do is wait for the NXPI price to penetrate and close below the trend line. Once that happens, all you need to do is place a market sell order at the closing price of the bar that closed below the trend line, which happened to be $83.26. 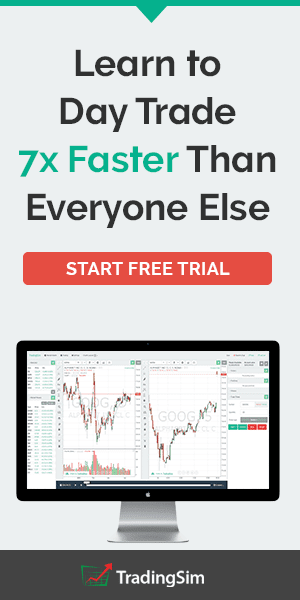 In this particular example, you could easily make $0.10 profit without using any leverage whatsoever, within 30 minutes! On the other hand, if you waited for the Mass Index indicator reading to fall below 26.5, as the developer originally intended, your entry price would have been $83.11. Now, use a pocket calculator to figure out how many cents you would have made in that trade. Done with using the calculator? The answer is probably 0, if your broker is generous enough to let you trade without charging any commissions or spreads. No? Bad luck, it’s a loss. If you use the simple trend line breakout strategy every time you see the price penetrating a trend line, you can get many signals, but most of them would be false signals. However, by combining the simple trend line breakout entry with a Mass Index reversal bulge strategy, you can cherry pick only the best reversal signals and increase your odds of turning profitable trades. As we discussed earlier, the Mass Index is more of a volatility indicator. You should use the Mass Index in combination with other technical indicators to validate trade signals. Does it matter which indicators you are using to identify the direction of the trend? No, not really. As long as you properly use the Mass Index with your favorite directional bias indicator, you should be able to easily spot a trend reversal with accuracy. 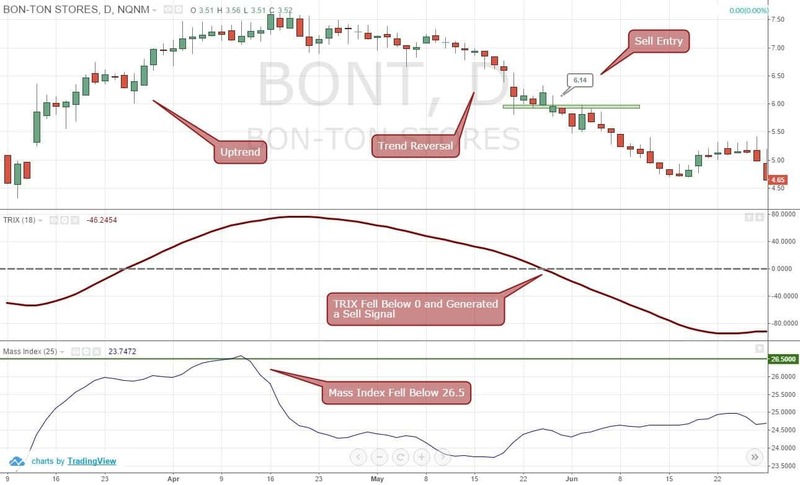 In figure 4, you can see that the BONT price was trending upwards and after the Mass Index reading touched and fell below 26.5, the stock started to go range bound for a while. In this type of market condition, you would probably feel clueless about how to play the stock. However, if you use a technical indicator to identify the directional bias, you can easily get an entry signal for the potential trend reversal. Here, we applied the TRIX indicator, which generated the sell signal. As you can see in figure 4, as soon as the TRIX reading fell below zero and generated the sell signal, the BONT downtrend accelerated. If you placed a sell order at $6.14 per share, you could have easily made $1.44 in profit on this single trade. TRIX is a nice directional technical indicator, but you can practically use any other oscillator along with the Mass Index indicator. For example, a slow stochastics cross just after the Mass Index reading went above 27 would yield great results as well. While you can use a lot of other technical indicators such as standard deviation to measure volatility, the reversal bulge function of the of the Mass Index can offer you a unique perspective about the market condition. Here, we discussed using the Mass Index indicator to spot trend reversals, but you can also use the Mass Index to trade trend continuations. 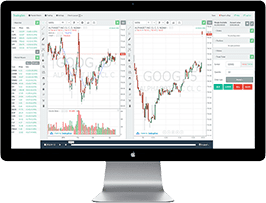 The Mass Index indicator can prove to be a great tool for short-term trading when you take the time to change the sensitivity or periods according to the historical volatility of the particular stock that you are studying. That is why you should use a back-testing program like the Tradingsim to fine tune which period settings you should use on certain stocks. 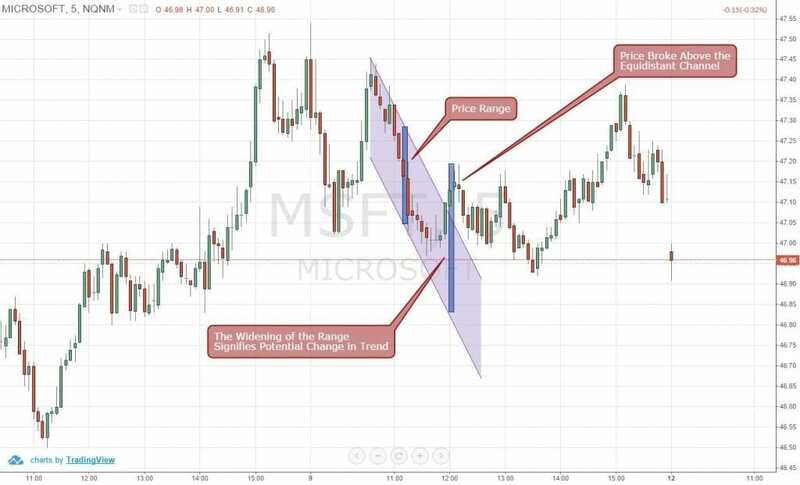 Once you learn how to use the Mass Index indicator by combining other technical trading strategies, you can easily identify potential trend reversals and improve the timing of your short-term trades.